"We've made a deal with Mexico, and we'll get started with Canada immediately," Trump said. He also said he would "be terminating the existing [NAFTA] deal very soon" because NAFTA has "a lot of bad connotations" and has been a "bad deal" for the United States. The breakthrough between the U.S. and Mexico involved an agreement on the amount of North American content a vehicle must have in order to pass duty-free across borders. The percentage was moved up to 75 percent from its current level of 62.5 percent. Negotiators also agreed to increase the percentage of vehicles built in factories paying an average wage of at least $16 an hour. U.S. automakers have opposed raising the North American content requirement, but the United Auto Workers union has supported it. The third NAFTA partner, Canada, has not been at the negotiating table for many weeks. It will now presumably re-engage. Prior to Trump's remarks, Canadian Foreign Minister Chrystia Freeland said through a spokesman that "Canada is encouraged by the continued optimism shown by our negotiating partners. Progress between Mexico and the United States is a necessary requirement for any renewed NAFTA agreement." But Freeland also said, "We will only sign a new NAFTA that is good for Canada and good for the middle class. Canada's signature is required." The three nations had hoped to wind up negotiations by the end of this week. U.S. law requires a three-month waiting period after a deal is completed before Congress can ratify it. Mexico will swear in its incoming president, Andrés Manuel López Obrador, on Dec. 1. If a NAFTA deal isn't signed before then, López Obrador could demand changes — and a deal that took years to negotiate could unravel. But Trump and U.S. Trade Representative Robert Lighthizer said Monday that they plan to send a Mexico-U.S. deal to Congress by Friday to start the clock on the waiting period. And there are still a number of thorny issues that must be resolved before a final agreement is reached between the three nations. One is the Trump administration's demand for the removal of arbitration panels that currently settle disputes under NAFTA. The Trump administration is also seeking a sunset clause that would end the pact after five years, unless the three countries explicitly agree to continue it. 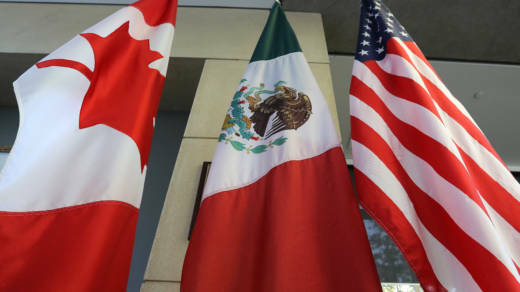 Both Canada and Mexico, as well as many in the U.S. business community, reject that idea.